Description: The Serpent is a suitable Macrame project for older children, as well as beginners. 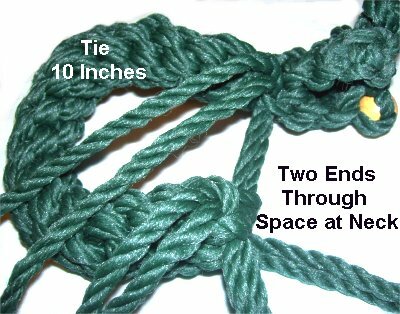 There are only a few decorative knots used in the design, so it's easy to make. 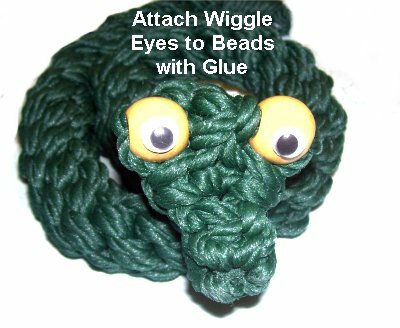 This Macrame snake features a body make with a chain of knots that spiral, a flat head, and large eyes. Adding wiggle eyes to the beads makes him look really interesting. Adults may need to participate, especially if the child is not familiar with the basic knots. 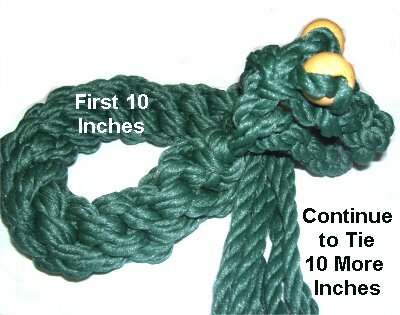 Be sure to practice each knot before making the snake. 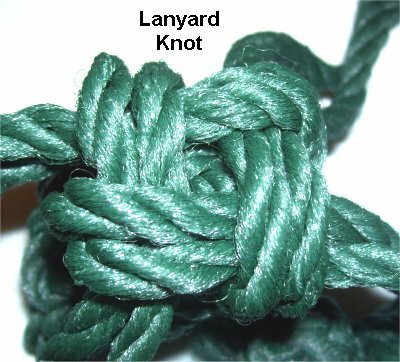 Please note that the Lanyard Knot is now named the Crown Knot. The images still say "Lanyard Knot". Prepare the ends of the cords with tape. Step 1: Locate the center of a 1.5-yard cord. 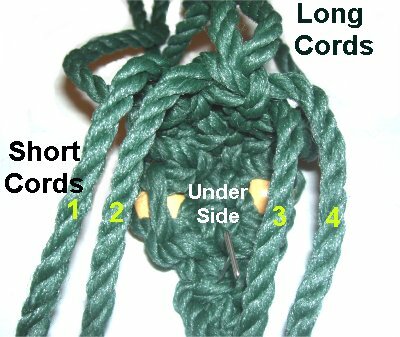 Fold the second 1.5-yard cord in half, and use it to tie a Larks Head knot onto the first cord, placing it at the center. 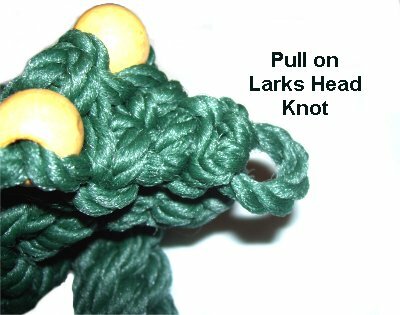 The front of this Larks Head knot is the nose for the Serpent. Step 2: Flip the knot upside down, and secure it. Arrange all four ends vertically, and mentally number them 1 - 4. The working cords are 1 and 4, and the fillers are cords 2 and 3. Tie one Square knot with the working cords. 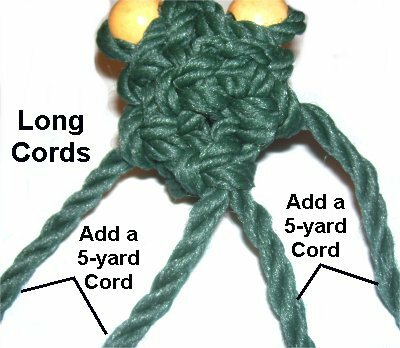 Step 3: Fold a 6-yard cord in half. Place it under cords 1 and 2, and secure it. The ends of this new cord are the working cords for the next Square Knot. The short cords (1 and 2) are the fillers. 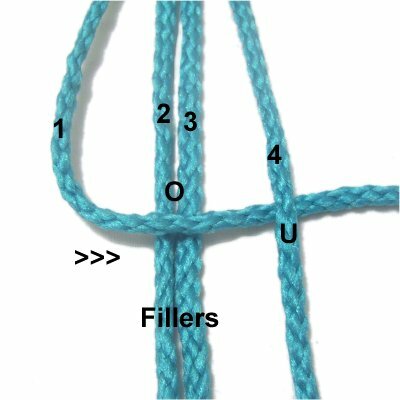 The first working cord you move, which curves over the fillers, determines the knot's direction. The knot in step 3 will face left, if you move the left working cord in front of the fillers for the first step. 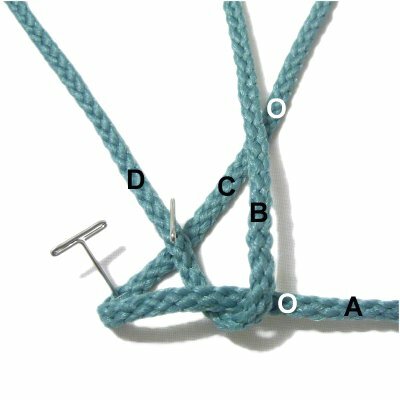 The knot in step 4 will face right, if the right working cord is over the fillers for the first step. 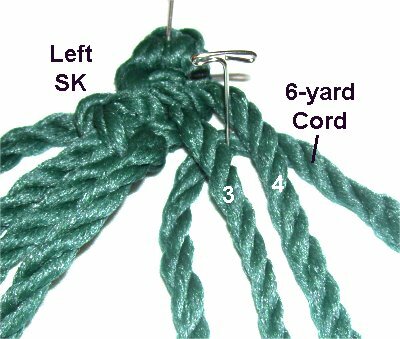 Step 4: Fold another 6-yard cord in half. Place it under cords 3 and 4, and secure it. 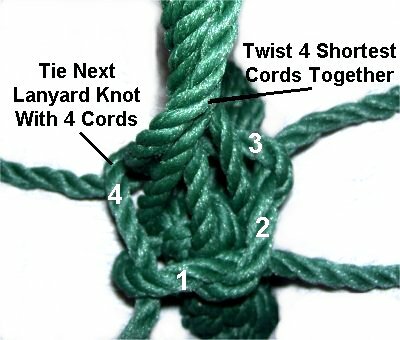 Attach it as in the previous step, but make sure it's a right Square Knot. 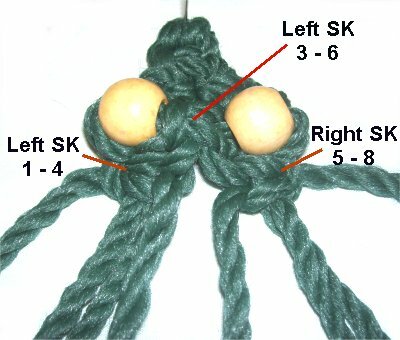 Step 5: Here is a closer view of the two knots. Mentally number the cords 1 - 8 as shown. Left Eye: Pass cord 2 through the first bead, heading left to right. Pass cord 3 through as well, heading right to left. Right Eye: Pass cord 6 through the second bead, heading left to right. Cord 7 goes through the hole right to left. Step 6: Mentally re-number the cords, so the four in the center are 3 - 6. Cords 1 and 2 are on the left, and cords 7 - 8 are on the right. 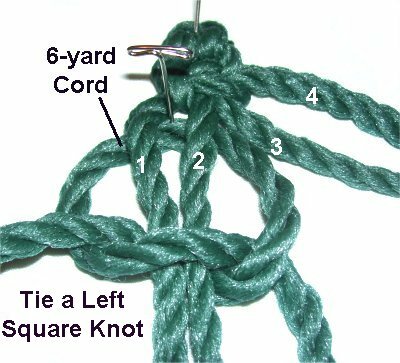 Tie a left Square Knot with cord 3 - 6. It should rest between the two eyes. Tie a left Square Knot with cords 1 - 4, and a right SK with cords 5 - 8. Tighten the knots firmly so the eyes bulge upward slightly. Step 7: Tie a left Square Knot with cords 3 - 6. In the next row tie a left Square Knot with 1 - 4, and a right SK with cords 5 - 8. For the final row, tie a left SK with cords 3 - 6. Step 8: Flip the head of the Serpent upside down and secure it to your board in two places, so it's stable. Separate the short and long cords. 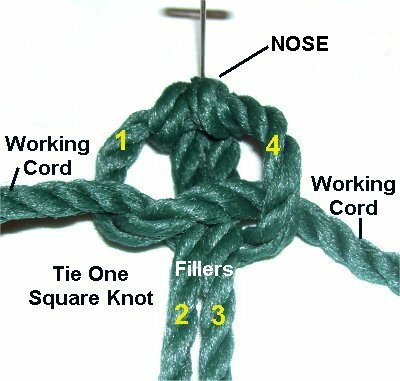 Using only the four short cords, tie 3 Square Knots to make the lower jaw. The working cords are 1 and 4. 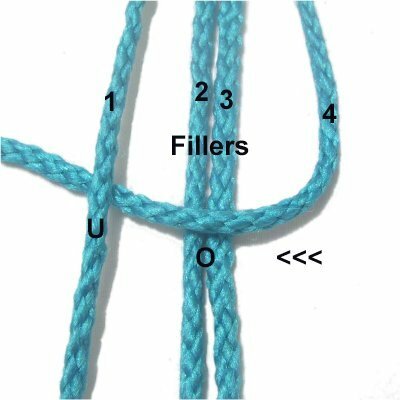 Use two short cords to tie an Overhand knot, so it rests against the three knots you just tied (at the tip of the jaw). Apply glue just before tightening the knot, so it's on the inside of the knot. Do the same with the other two cords. Trim the ends to 3 inches. Do not cut them off completely. Step 9: To finish the head of the Serpent, flip the design back to how it was originally (face up). 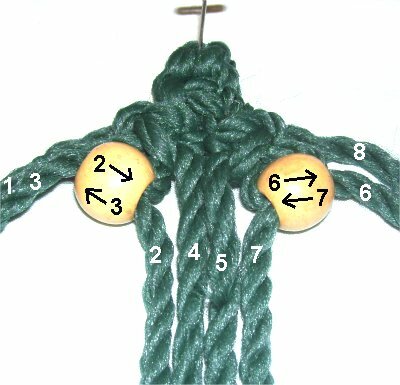 Add two 5-yard cords to the four long cords that are left, using the same technique as in steps 3 and 4. Arrange the head of the Serpent as shown. 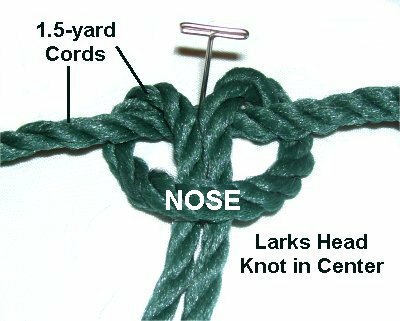 Pull on the segment at the end of the nose, which is the Larks Head knot you tied in step 1. Make it as large as possible. Pass the 4 cords in the lower jaw (made in step 8) through the loop from the bottom up. 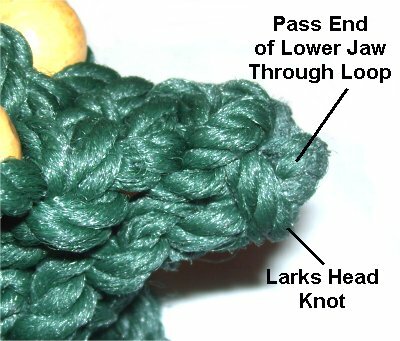 Make sure the Overhand knots pass through the loop. Weave the ends through spaces in the head, so they rest along the bottom of the upper jaw. Apply glue. Step 1: Organize the long cords into four sets of two. Bundle each set to make them easier to work with. 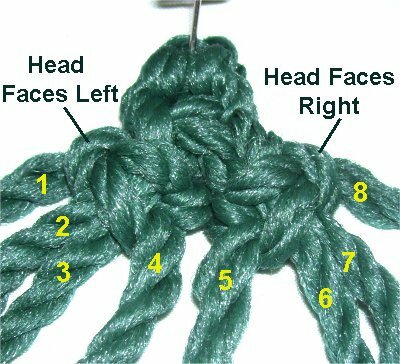 Step 2: Make a series of Crown knots, following the instructions below. Stop when the sennit measures 10 inches. 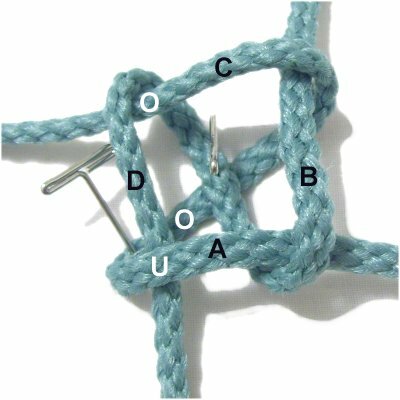 The images below show a Crown knot made with only two cords (one cord per segment). 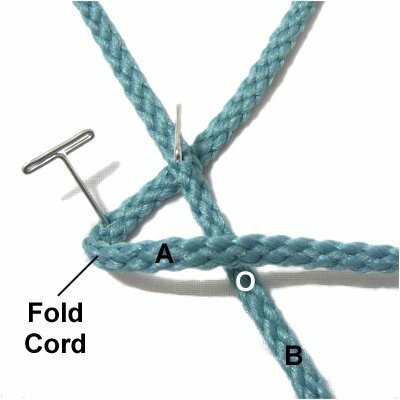 The knots you will make have 2 cords per segment (working together). The cords will be coming off the head rather than secured in the center, but the process is the same. Make sure the cords are arranged neatly after you fold each segment. Mentally number the segments A - D, beginning on the lower left. It helps if you place the head of the Serpent between your knees to work on the body. Move the two cords in segment A to the right, so they rest on top of segment B. Make sure you leave a space for the fourth set of cords to pass through. Fold the two cords in segment B towards the back of your board (backward). Position them on top of segment C.
Fold the two cords in segment C to the left. Place them on top of segment D.
Fold the two cords in segment D towards you (forward). Pass them through the space made by segment A where it folds, over - under. 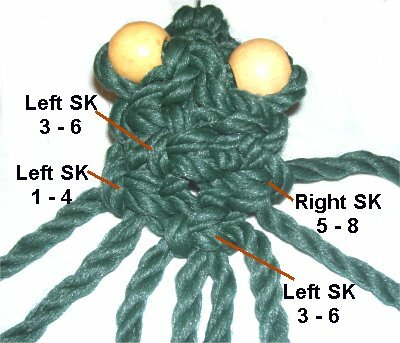 Pull all four segments gradually to tighten the knot. Step 3: To coil the body, curve it towards the head and neck of the Serpent. 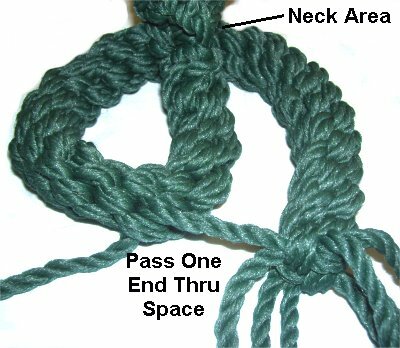 Pass two ends through a space at the neck. This step is optional- You can leave the body straight if you wish. 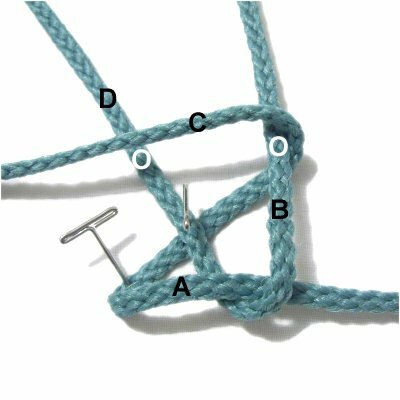 Important: When you resume tying the Crown knots, start with the two cords you passed through the space at the neck. Step 4: Continue to tie Crown knots for at least 10 more inches. To make sure you have enough material to finish, stop when the shortest cords are around 12 inches. Step 5: Pass one cord through a space in the first 10-inch sennit (if you are coiling the body). Tie one more Crown knot. Hold the Serpent between your knees for the next step. Step 6: Bundle the four shortest cords, and twist them together. You may need someone to help hold them upright. Tie 5 more Crown knots with the four remaining cords. 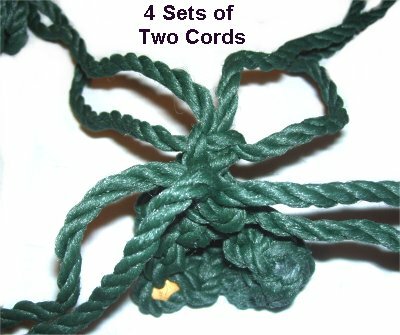 One cord should pass behind the bundle, so the knot surrounds the four twisted cords. Step 7: Find the longest cord and wrap it around all the others 4 times. Finish with a Half Hitch. Before tightening, apply glue to the inside of the knot. 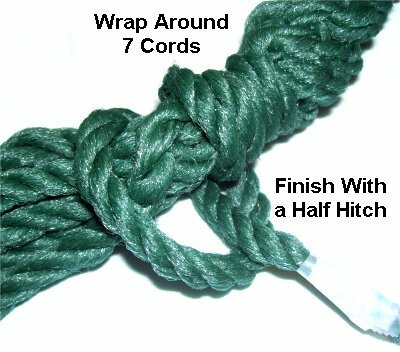 Select another cord and tie a Half Hitch around all the others (including the one just used). Apply glue to the inside. When it's dry, cut off the extra material. Step 8: Apply glue to the wiggle eyes and attach them to the beads, completing the Serpent. Have any comments about the Serpent? Contact Me.